Torin Chiles’ active performance career as an operatic tenor has spanned 20 years and his resume is replete with engagements from North American symphonies and opera companies. Mr. Chiles appeared on CBC television’s Opening Night as McAlpine in the critically acclaimed new Canadian opera, Filumena which was performed in Calgary, Banff, Ottawa and Edmonton. Many live operatic performances have been featured on CBC Radio Two’s Saturday Afternoon at the Opera. Mr. Chiles’ credits include: Pinkerton and Count Almaviva for Opera Lyra at the National Arts Centre; MacDuff for the Manitoba Opera in Winnipeg; Pang for Vancouver, Montreal, Calgary, Edmonton and Arizona; Bob Boles in Montreal; The Magician in The Consul for Montreal, Manitoba and Milwakee. Mr. Chiles has premiered many new Canadian works such as Filumena by John Estacio, Erewhon by Louis Applebaum, Taptoo by John Beckwith and The Lady with the Lamp by Timothy Sullivan. A Gilbert and Sullivan Gala with the Winnipeg Symphony under maestro Bramwell Tovey was recorded for the CBC SM5000 series and is available commercially. Torin Chiles began teaching part time at Western University Canada in 1999. 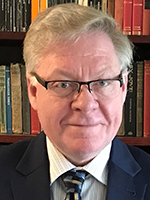 In 2004 he was appointed to the Don Wright Faculty full time and served as the Voice Division Co-ordinator at the DWFoM from 2006 to 2011 and again from 2016 to the present. Mr. Chiles has taught undergraduate and graduate vocal pedagogy courses at Western since 2004 and is in ever-increasing demand as a clinician, adjudicator and examiner. Recent seminars have been presented to the Schulich Faculty of Medicine at Western; the Alberta Music Educators Association, NATS Ontario (National Association of Teachers of Singing) and Conservatory Canada. A NATS member since 1999, Torin Chiles is a past president of NATS Ontario, past District Governor. In addition to having served on the strategic planning committee at the national level and he currently serves on the NATS Foundation national board of directors.